As the amount of content produced online continues to grow at a rapid speed, content marketers are finding it harder and harder to stand out in an ocean of material that is all deemed to be valuable.. The best way to learn how to break through the noise is to find which content marketers are successful at it and learn from their experiences, strategies, and mistakes. At ImagineEasy, we help schools and districts teach their students effective reading and writing. 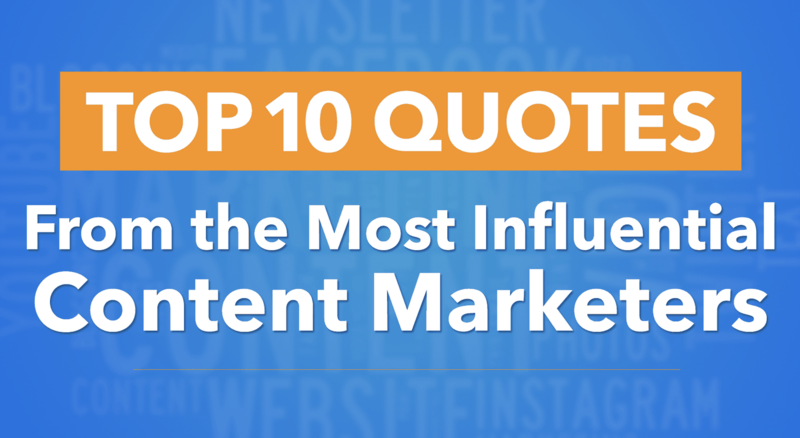 We curated from the most influential websites, marketing blogs, Twitter, Facebook and LinkedIn profiles to find a list of 10 content marketers who were doing it right. We received a wide array of responses touching on the importance of empathizing with each customer, developing powerful writing skills, and getting a firm grasp on the business and financial side of marketing. Empathy is the bridge between you and your customer. If you ask Rand Fishkin of MOZ, he’ll tell you how empathy can be a content marketer’s greatest skill. Stepping into the shoes of the customers lets you know exactly what they want, how they think and how they’ll respond to your marketing efforts. Knowing why you’re creating your content and what your audience is hoping to gain from it will shape the way you produce and develop your materials. Lee Odden of Top Rank Online Marketing would also agree, in so much as to say that creating content without empathy means neglecting what your customers care about. If content marketing is truly meant to inspire them to act, then it must be in alignment with their information discovery habits. Telling stories with your content is what will help you connect to people on a human level. Michael Brenner of NewsCred believes that removing your brand from the equation is important because it shifts the focus from being about you to being about your customer. And by not building your content simply to promote yourself, your audience becomes deeper involved in the relationship because authenticity remains as one of the focal points of your content. Invest your best time in creating quality content. Heidi Cohen, a professional marketing professor and speaker also agrees with this point. When asked what she believed was the most important factor for a content marketer to succeed, she emphasized the need to create quality content. Millions of articles, videos, podcasts, and presentations are created each day, which gives online readers and news seekers a long list of things to teach them, inform them, and inspire them. In order to stand out and produce something worth investing time into, Heidi recommends that you keep showing up at your computer desk to create (each and every day). By learning how to craft better content over time, your voice will become more defined and the quality of your work will become worthwhile. Understanding distribution is a huge factor as well according to Jeff Bullas who is a marketing blogger and strategist. Building strong and highly engaging distribution channels (email, social media and search) will help expand your reach to every place that customers go online. Plus, using strategies like crowd-sourced marketing will help spread your content far and wide. Knowing how to build great content and how to present it are two sides of the same coin. Treat your content like one of your most important business assets. Scott Abel from The Content Wrangler is a strong believer that any content worth investing into is worth being viewed as an asset to your business. If you want to truly develop stuff that’s great, you need to drive your efforts in a way that builds a bridge between all that you do. Much too often we focus on one-off campaigns and deliverables, which as Scott puts it can be “time-consuming, error-prone, and overly expensive”. The amount of work we put into our content should be worth respect if it is how you decide to communicate with your target audience and potential customers. Knowing that your content is tied to your business goals is important to remember. Ann Handley from MarketingProfs believes that knowing what your content is driving your audience to do is central to your whole content development process. Clear communication built on the foundation of solid writing is what will make your content fluidly move your audience from viewers into customers. Become a content marketing jack of all trades. Being “ambidextrious” is a skill Joe Chernov of HubSpot recommends all content marketers must have. Joe summed up his answer to the question in one word: “Balance”. Understanding the multiple elements of good content involves having an eye for design, an ear for writing, and analytical skills that have you understanding the data and metrics your content produces. A powerful term used by Brian Clark of Copyblogger to describe your role as a content marketer is to become a “media mentor”. Developing useful and engaging information that addresses the needs of your customers helps establish your credibility and will convince your audience that you are the expert to turn to for guidance. And perhaps the most important word in all of content marketing is “consistency”. Joe Pulizzi from Content Marketing Institute stress the importance of following through with your publishing schedule. Maintain a strong dedication for building quality content focused on the needs of the customers. Master the skills of writing, creation design, and interpretation so you can adjust and define your message in accordance with what your audience needs. Make sure your content is treated seriously and produces the business goals you hope to achieve in the long run. What tips do you have for Content Marketers looking to create powerful and engaging content in 2014? Josh develops creative, out-of-the-box ideas at Imagine Easy Solutions and turns them into the marketing magic. He also runs a YouTube channel called the The Josh Speaks with over 50,000 subscribers, helping teens and adults learn to be their best selves.